One ye ar on from the devastating tragedy at Grenfell Tower, fire safety and compliance again feature heavily in the headlines. Compliance with UK fire safety standards, as specified in the Building Regulations, is essential to providing adequate protection for life and property in the event of a fire. Developments in glass technology have resulted in the introduction of more sophisticated glass products to the market, with increasingly higher fire resistance performance both in terms of integrity (resistance to fire penetration) and insulation (resistance to the transfer of excessive heat). Tufwell Glass provides a comprehensive range of fire-rated glass and can advise on which product is right for your business. Fire-rated, or fire-resistant glass is glass that is specially treated so that it can withstand high temperatures and prolonged exposure to heat. Fire-rated glass can help keep flames and smoke from spreading (known as compartmentation) and as such it can form an important part of an integrated fire safety strategy. How does fire-rated glass work? Fire-rated glass is a type of tempered glass (see Is Your Glass Tough Enough) which enables it to endure higher pressures than ordinary glass. Standard window glass will break when the temperature reaches around 120°C. Fire-rated glass can survive in more than double this temperature. Fire-rated glass can also withstand thermal shock – that is, the extreme heat of fire combined with high pressured water. Most glass will shatter under the simultaneous stresses of hot and cold temperatures, which in a fire-fighting situation could endanger lives. Fire-rated glass mitigates that risk. Prior to being rated, fire-resistant glass is tested against national standards by independent laboratories. Ratings that reflect the duration of testing are then given. For example, if a fire-resistant glass product has a 30-minute rating it should contain flames and smoke for the first 30 minutes of a fire. What types of fire-rated glass are available? There are three main types of fire-rated glass, which are all available from Tufwell Glass. Tempered fire glass is highly resistant to heat but cannot endure sudden changes in temperature. It carries a maximum integrity rating of 20 minutes. Ceramic fire glass is versatile but it does not offer any level of thermal insultation. It has excellent heat resistance and durability and can have a fire rating of up to 180 minutes. Intumescent laminated glass is the optimum protection in both integrity and insulation. 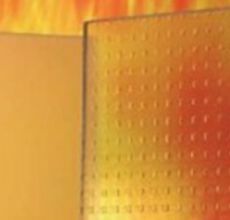 This laminated glass includes a clear, intumescent interlayer, which in the event of a fire expands to increase in volume and transforms into a rigid, opaque and heat-absorbing fire shield. Tufwell Glass supplies the Pyrobel and Pyrobelite ranges of glass, the leading fire-resistant glass on the market. Fire safety is a serious business. Give Tufwell Glass a call today on 01293 533 533 or email sales@tufwell.co.uk to talk to our fire-rated-glass experts.